Discover the best crochet baby blanket patterns in this selection of crochet patterns for the nursery and find your next favorite pattern. Baby blankets are a dual-threat – they’re essential for keeping babies warm and cozy, but they’re also great decorative pieces for the nursery, too! Crochet baby blankets are a great way to try out a blanket pattern without fully commiting to a large afghan. Try making one of these baby afghans as a baby shower gift – the little one will love it! Choose from quick, simple stitches to more complex designs, from crochet ripple patterns and other designs to cables stitches. You can even make some round baby blankets or tiny, precious loveys (a lovey, for those not in the know, is a baby blanket with an animigurumi figure). Skip traditional and go for a blanket with more texture and interesting stitches. This baby blanket is great for little ones and will be cherished for many years. Wrap up your littlest angel in this precious hooded baby blanket that features its own crocheted halo. Made with soft, velvety yarn, this blanket draws inspiration from quilt blocks and features a unique angel design that appears when the blanket is laid flat. A half slice of pink lemon adorns this baby throw for a contemporary, whimsical feel. Perfect for any baby or toddler, this fun blanket is ideal for family car trips this summer — little ones will stay toasty warm even while you blast the air conditioning! Worked first as a half circle, stitches are then added to create a rectangle shape to make it into the full-sized throw. Add a bit of surface crochet to define the lemon segments and you’ll be ready to roll! Use up those colored scraps with one of the very first weaving techniques we learn as children – braids! The six strands in each braid are knotted at the ends while extended single crochet stitches around the braided yarn lock the bright colors to the blanket and create a faux spike stitch that fuses the colors together seamlessly. 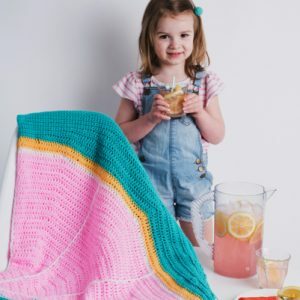 Enjoy crocheting a squishy-soft baby blanket sprinkled with pops of pastel colors. Worked in the round from the center to the lacy border in an easy-to-memorize stitch, this blanket makes the perfect gift for new mothers. Wrap up your little one in a blanket of falling leaves. The main body of this blanket is worked back and forth with four colors of yarn. Keep it sweet and simple with this lovely baby blanket. The scallop edging is the perfect touch. Babies love texture and interesting pattern designs – this blanket has both! With cute little animals all over, this blanket is perfect for a baby’s room.